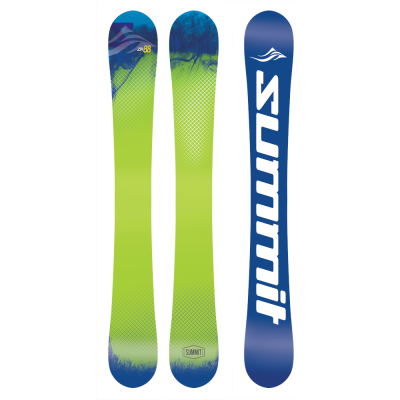 The Summit ZR 88 cm Twin Tip Skiboards 2019 are truly one of the funnest skiboards made by Summit Skiboards. Twin tips and wood core, sintered bases and multiple binding options and more. The Summit ZR 88 cm Twin Tip Skiboards 2019 are truly one of the funnest skiboards made by Summit Skiboards. With the ZR 88’s, Summit continues to take the sport of skiboarding to a whole new level of performance, while being able to carve circles around anyone (literally). These are fast, turn super quick thanks to the parabolic shape, float in the soft stuff and basically will take you anywhere you care to go on the mountain. These truly feel like having a pair of skates on with how maneuverable they are. The Summit ZR 88 cm Twin Tip Skiboards 2019 feature a parabolic sidecut is constructed to function impeccably with the solid birch wood core to deliver almost effortless carves. These hold an edge no matter how hard you charge it, even on ice. Now you can truly rip the moguls, fly through the glades making faster turns than you can believe and still hold a solid edge when flying down the groomed runs. Symmetrical twin tips allow ease of riding forwards and backwards and are great for playing in the parks and pipes or even moguls. Recommended for: beginners, intermediate and even advanced riders – all levels can truly enjoy the fun that these provide. Skaters will especially feel immediately at home on these and these Summit ZR 88 cm Skiboards truly feel like skating on snow. Great for: sheer playtime including beginner/intermediate runs, pipes and parks, moguls and pure carving with ease. Tuning: We recommend getting your bases hot waxed before riding. You can choose our Add a Hot Wax Service and receive your skiboards waxed and ready to ride. You can also choose to do it yourself with our Quick Mini Tune Kit to maintain your skiboards in optimal condition. 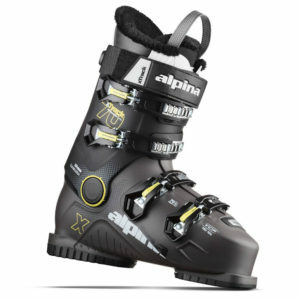 The Atomic L10 bindings come pre-mounted with free wide brake. The L10 features an excellent range of release values and is easy to operate. Adjusting the front clamp and heel can be done by hand without tools. These bindings feature: DIN range of 3-10. Twin pivot. Toe height adjustment. Adjustments can be done by hand and fits ski boot sizes 261-384 mm (approx. size 4 – 14 U.S.). Height: 30mm. Also available are the Atomic L7 bindings for smaller boot sizes and Technine Custom Pro DS Snowboard Bindings with riser kit. You can also mount your own Snowboard Bindings with our Snowboard Binding Adaptor Kit. Want to learn to ski in one day – try these! Cap construction. An aluminum layer under the top sheet and a solid birch core all contribute to great binding retention while allowing full flex. A layer of rubber dampening makes for additional smooth riding, absorbing those vibrations, but allowing maximum road feel. Traditional Camber: Camber produces stable footing at high speed with maximum edge grip, being able to tackle early morning groomed to East Coast ice without effort. This means smooth carving edges that you can trust when you need it the most. Wood core: vertically laminated birch wood core runs the full length of the skiboards, tip to tail, providing a highly responsive energy as well as greater long term durability. The wood is Northern Hemisphere birch which is very light, yet super strong. Colder temperatures create wood that is denser, thus super strong, while being very light in weight. This is why we choose wood from the Northern Hemisphere. This is sandwiched between 3 layers of triaxial fiberglass. An additional layer of Kevlar is is added for not only extra strength and impact resistance, but super long durability that maintains the energetic pop in the skiboards. Die-Cut Sintered bases: this is one of the best base materials for durability, maximum wax absorption and speed. These p-tex 4000 bases have less friction and thus more speed as well as less vulnerability to abrasion and impacts. Bases feature a special flourescent orange color that actually reflects off the snow. Polyurethane Protective top layer: protects the graphics and provides greater durability. UV protection. Stainless Steel Inserts: 4 stainless steel inserts are centered within each skiboard, in a standard 40 X 40mm skiboard binding mount pattern for non-release bindings. Inserts are 1/2 inch back from dead center – the perfect position for non-release bindings. Inserts also increase the retention strength of the bindings and allows for quick and accurate mounting, making it easy to interchange with other 4 hole pattern bindings. These are built in to mount non-release skiboard bindings or snowboard bindings. Edge bevel: 1 degree base and side bevel of 89 degrees – great for carving with ease. These aggressive edges are great for ice, and lay it over carving.